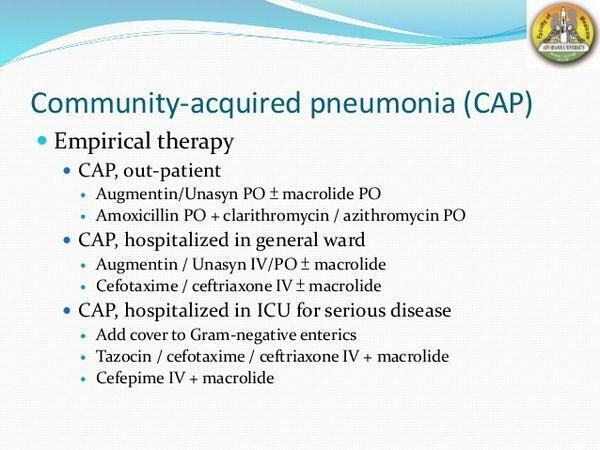 Many agents are in development for the treatment of community-acquired pneumonia (community-acquired pneumonia). The majority of drugs in late-stage development are antibiotics that build on existing drug classes (e.g., fluoroquinolones). Reflecting the limited number of innovative leads, the high attrition rates, and the high development costs relative to the return, no novel classes have been introduced in the past two decades, with the exception of the oxazolidinone linezolid (Pfizer's Zyvox), which primarily targets niche antibacterial market segments such as complicated hospital infections. TABLE: Emerging Therapies in Development for Community-Acquired Pneumonia, 2004 summarizes emerging antibacterial agents in late-stage development and their expected sales potential in the community-acquired pneumonia market. The antibiotics currently available for treatment of community-acquired pneumonia are highly effective and well tolerated. 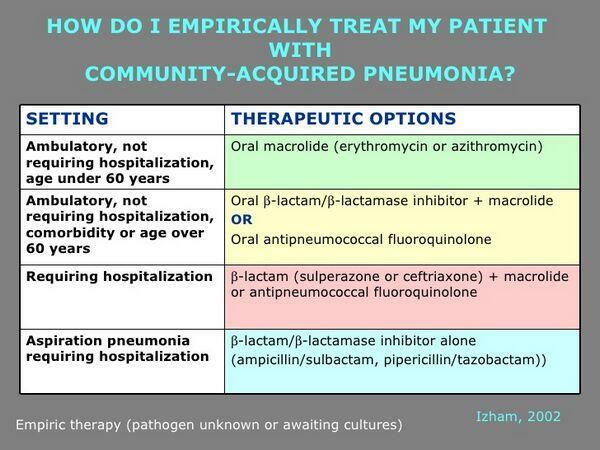 Therefore, the barriers to new agents' entry into the community-acquired pneumonia market are relatively high. However, given the severity of this infection and its relatively high mortality, the community-acquired pneumonia market remains relatively receptive to novel agents that can provide a clinical or economic benefit. The macrolides and fluoroquinolones launched over the past decade (e.g., azithromycin, moxifloxacin) have provided advantages such as higher activity against respiratory pathogens, broader spectrums of activity, and more convenient dosing. Emerging agents in these two classes will face intense competition to differentiate themselves in the market. However, one of the drivers of future opportunity within these classes will be development of agents capable of overcoming resistant pathogens, particularly as prevalence of resistance to β-lactams and macrolides — and eventually, fluoroquinolones — continues to grow. Furthermore, opportunity for emerging fluoroquinolones exists in pediatrics because this class is generally contraindicated in children. Preolinioal; R = Registered; S = Suspended. The highest unmet needs in community-acquired pneumonia are those for hospitalized patients with severe infections, particularly patients admitted to the intensive care unit (ICU). The majority of community-acquired pneumonia cases are mild, but mortality in hospitalized patients reaches 5-20%, and mortality in patients admitted to ICUs ranges from 35% to more than 50%. The recent upsurge in the development of the streptogramins, oxazolidinones, and other narrow-spectrum agents reflects the demand for new agents that are active against problem pathogens, particularly those that are resistant to current therapies for critically ill patients. In analyzing emerging antibacterial agents, several factors must be considered that will be important for success in the community-acquired pneumonia market. First, the spectrum of activity must provide appropriate coverage of key pathogens, particularly Streptococcus pneumoniae and Haemophilus influenzae and the atypical pathogens such as Chlamydia pneumoniae, Mycoplasma pneumoniae, and Legionella pneu-mophila. Second, to be commercially successful, new agents must offer competitive advantages such as activity against resistant pathogens (e.g., drug-resistant S. pneumoniae), a higher barrier to resistance, and/or be extremely well tolerated. Because there are numerous once-daily options already on the market, emerging products must have once-daily dosing. Because the community-acquired pneumonia market has a large hospital segment, availability in both oral and intravenous (IV) formulation is important for wide uptake. Finally, a short treatment course is highly desirable because this attribute can improve compliance and reduce overall cost. As discussed in the "Overview" section in "Current Therapies," the measure of in vitro potency of antibiotics is the minimum inhibitory concentration (MIC) of antibiotic required to inhibit growth of a bacteria. In clinical trials, the primary end points used to evaluate antibiotics are clinical response rate or clinical cure rates, which refer to the improvement in subjective symptoms and/or objective measures such as chest X ray. Bacterial, or microbiological, eradication rate refers to the elimination of pathogens in sputum and/or in respiratory tract samples.